Gail Rubin, “The Doyenne of Death,” will show and discuss comedic films for funeral planning conversations at the Association for Death Education and Counseling (ADEC) annual conference in Miami. Her presentation will take place on Thursday, June 23 at 10:00 a.m. at the Intercontinental Hotel in downtown Miami. Rubin, the author of A Good Goodbye: Funeral Planning for Those Who Don’t Plan to Die, will show two short funny films that can help start end-of-life ritual conversations. Carpet Kingdom, shown at the 2009 Telluride Film Festival, brilliantly explores themes of living life playing it safe in hypocrisy versus embracing our true heroic, expressive selves. It also illustrates the importance of doing more than simply writing down funeral plans. The film shows how the deceased’s wishes for what he wanted in a funeral can be ignored or hijacked. Plots, a nine-minute film, raises questions about life going on after the death of a spouse, burial arrangements, and having conversations about what arrangements might be made for burial with a second husband or wife. 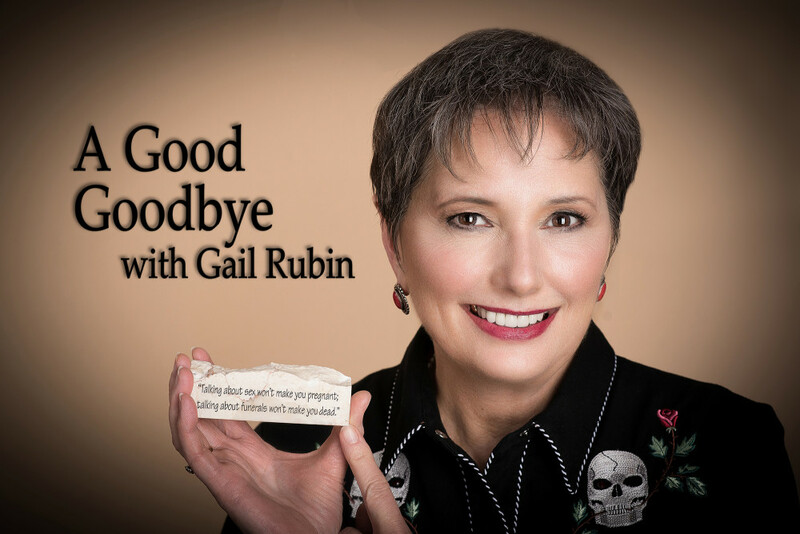 Gail Rubin has used these films in presentations to encourage discussion of end-of-life rituals. She is an event planner specializing in funerals and memorial services who speaks regularly to groups on getting the funeral planning conversation started. Rubin was a featured speaker at the 2011 Frozen Dead Guy Days festival in Nederland, Colorado, where she led couples through “The Newly-Dead Game.” The game quizzed couples on how well they know each others’ last wishes. Her book, A Good Goodbye: Funeral Planning for Those Who Don’t Plan to Die, is a finalist in the 2010 Book of the Year Awards in the Family and Relationships category. A Good Goodbye illuminates how people can avoid stress at a time of grief, reduce family conflict, save thousands of dollars and create a meaningful, memorable send-off.